Industrial Fan Heaters – The FHTERM-E are Electric Unit Heaters with axial fans,a metal casing and electric heating elements, which are designed to heat rooms such as: industrial halls, workshops, warehouses,shops, commercial pavilions, sports and entertainment halls etc.These industrial fan heaters are very flexible and can work in a horizontal position as ceiling units and in a vertical position as wall mounted fan units.All of these electric unit heaters are supplied by a 3 phase /400 volt supply, which enables them to have a power output of 27kW at the largest size. 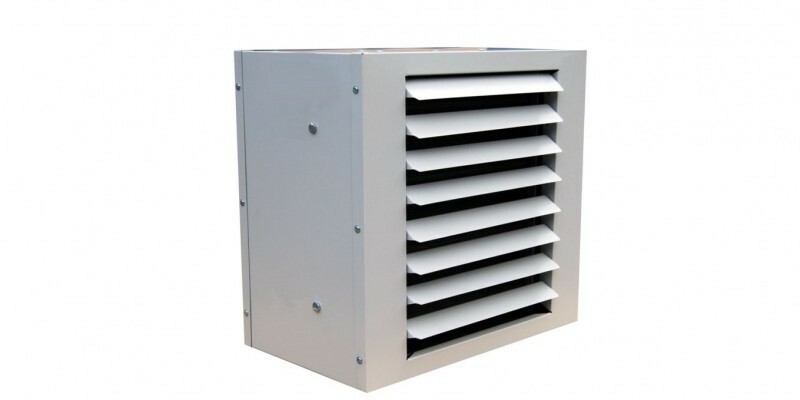 This factor ensures that you can heat really quite large commercial and industrial working environments, with the easy of installing these ceiling or wall mounted fan heaters, along with their low capital costs, make them an ideal solution for many industrial or commercial heating applications. As opposed to portable electric heaters, which will require a power lead, and also the aggravation of moving the units when you need to get at the area where the heater is located, or you need that floor area for something else, these wall or ceiling mounted electric fan heaters, once easily installed are out of the way, making for a cleaner and safer working environment. This means that perfectly suited to small industrial units, workshops,garages, consulting rooms, laboratories, florists, and shops and alike. All of these commercial / industrial electric space heaters can be thermostat (temperature) and time controlled, making them a great solution as frost protection heaters, in greenhouses or any other application where this is a necessary requirement. Total Heating Systems – Units can meet the total heating requirement in most industrial plants, commercial and recreational buildings, and in special purpose structures such as animal shelters. The features that make them the ideal selection for these types of buildings are a long heat throw, uniform heat delivery and low installation and maintenance costs. High up and out of the way, unit heaters provide heat into work areas for clean, safe, economical heating comfort. Supplemental Heating – They are ideal for spot heating applications during short periods of occupancy in the area to be heated. In out of the way locations, remote from areas served by the building’s main heating systems, electric unit heaters can often eliminate the expense of extending gas, steam, or hot water lines. Stand-by/Back-up Heating – Where fossil fuel supplies are interruptible or undependable, electric unit heaters are recommended as a stand-by or back up heating system to supply comfort to an entire building or any part of it. aluminum propeller type fan is connected directly to the motor shaft and is statically balanced for peak performance and low sound levels. Electric heaters with spirally rolled aluminium finned tubes;permanently fused for maximum heat transfer. Elements are resistant to thermal shock and vibration. As standard a single-row heat distribution grid — Adjustable up and down, the blades provide control over the horizontal air delivery of the unit heater. The discharge nozzle/ cone – for increasing the range of heated supply air stream. The discharge cone can also be fitted to the wall mounted industrial fan heater, to give it a larger air throw, if so required. NB – The maximum height at which you can mout these warm air unit heaters when using the slot diffuser is 4 metres. To mount our FHTERM-E warm air unit heaters , we supply a universal mounting bracket, that allows the Electric Unit Heater to be either wall mounted or ceiling mounted. When wall mounted, you can tilt or incline the heater 20 degrees from the plumbline. The bracket set comes in component form to be assembled on site as required. 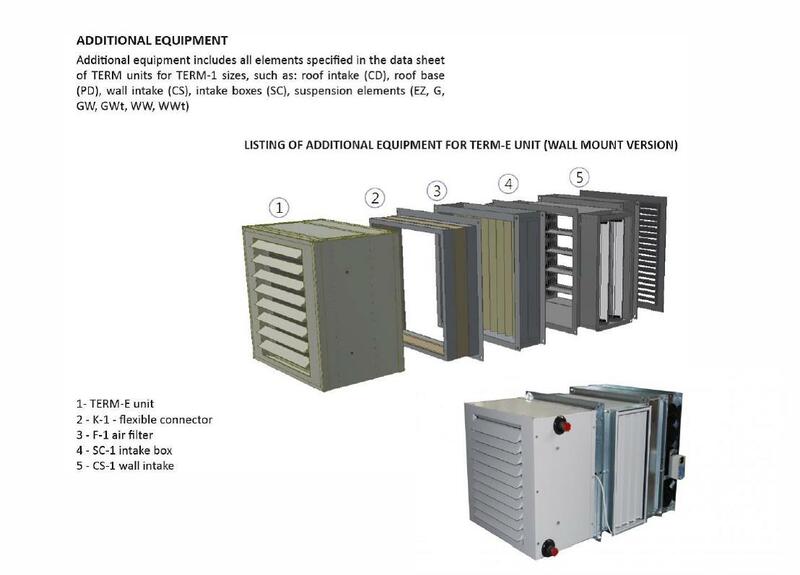 And below are some of the accessories available for the ceiling mounted industrial fan heaters – from left to right – Roof Air Intake Box, Roof Base and an Intake Box, which are used to draw and mix fresh and circulating air through the electric unit heater. Heating Coil Thermostat – (fitted adjacent to the heating element ) for reducing and monitoring of the outlet air temperature in the event of disturbed air flow (e.g. fan failure). Set-point range for the thermostat is 0ºC to 200ºC with a constant hysteresis of 50Cº, which yields a maximum supply temperature of 80ºC. Power Supply and Control Box -Type AT – Equipped with overcurrent breakers, relays and contactors, signal lamps, switches: Auto | Stop, 3-speed power and air efficiency adjustment and Heating /Ventilation. 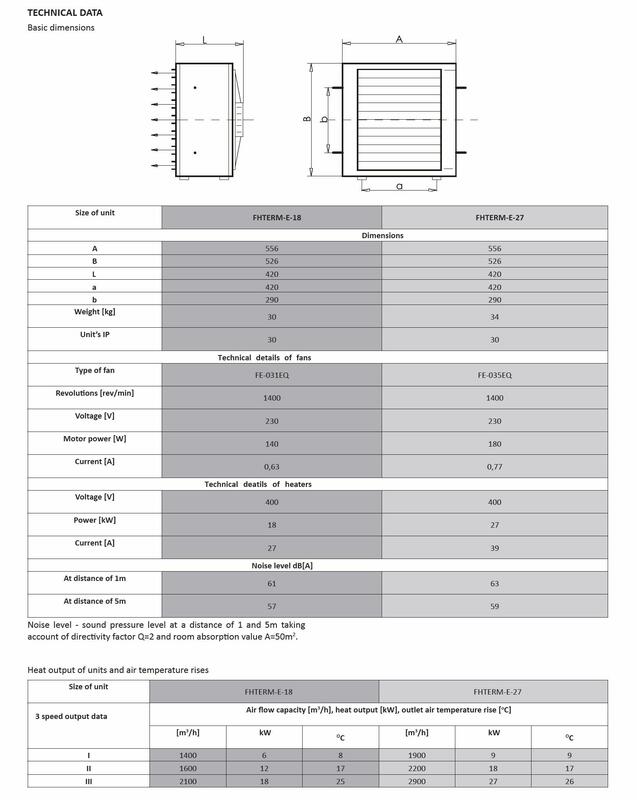 All of our Industrial Fan Heaters / Electric Unit Heaters are CE Marked and conform to the following directives –2006/42/WE – Machinery Safety Directive , with subassemblies meeting the requirements of the following directives:2006/95/WE – Low Voltage Directive , 2004/108/WE – Electromagnetic Compatibility Directive , as well as the following standards – EN ISO 12100 , and EN ISO 13857.All of these Heaters come with a two year warranty.